US ten-year bond yields have increased about 70 basis points to 2.8% over the last several months which gotten the attention of investors. While ancient market specimens like myself have a hard time seeing 2.8% as “high,” the change from the last several years is interesting. There is a good argument to be made that the worst of the bond decline is already past because of the relatively low levels of potential GDP and the well-anchored inflation expectations; and indeed, that is what I think is most likely to transpire. Nevertheless, it’s worth taking a moment to talk about the “nightmare scenario” for bonds and how yields could double from their current levels in a year or two. Numerous factors contribute to the level of bond yields. Today I want to focus on three important ones that currently are keeping yields down. Were these factors to reverse quickly, a bond market shock, in my view, would be in the offing. Unfortunately, the details are a bit technical, but I will try to step through them simply. The first factor is the term premium. If you didn’t care about the risk of holding a ten-year bond instead of a three-month bill, the yield would be more or less the average of the bill rates you expect over the next ten years. The difference between this average expected yield and the yield we actually see in the market is the term premium. That’s the compensation for holding a long-term bond. The average expected yield for the next ten years is, of course, unknown, but diligent economists sweat over their computers, trying to make a reasonable estimate. The chart below is one such attempt to estimate the term premium. What jumps out to me in this chart is that the term premium is quite low – about as low as it gets. Note that the last six month’s moves have not added to bonds’ attractiveness in terms of this measure. The moves since the last quarter have only compensated for expected future Fed rate hikes. Were this to move to its post-crisis average, as much as 150 basis points could be added to yields. The second factor is inflation risk. Both the level and the uncertainty of inflation expectations have been very low in recent years. This may be due in part to increased clarity from the Fed as to the level of inflation they are targeting and how they expect to meet it. The other part of the reason, though, may be factors that are subject to a quick reversal. Inflation is the key to the bad scenario I think investors should be aware of. Were inflation to move sharply beyond recent levels that would likely be reflected directly in the yields of long-term bonds – and could also be the key to force the first factor – the term premium – higher. Of course, yields can only become higher through prices heading lower. You might say: How bad can a bond drawdown be? Pretty bad! Even in the last 20 years’ bond bull market, the Bloomberg Barclays Long Treasury Bond Total Return Index had a 21% monthly peak to trough drawdown. The last snowball on the avalanche would be bonds’ reputation for being a safe haven in bad times. A sharp spill in bond prices, as was outlined in the first two factors, could make investors temporarily rethink bond’s status as a safe place to park assets, resulting in the sort of feedback effect that, in my analysis, could make short term losses substantial. 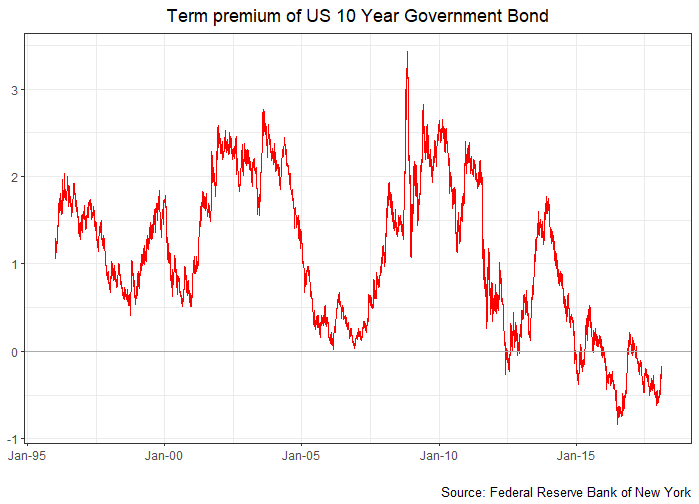 In sum, the nightmare scenario for bonds is for the term premium to increase sharply and substantially from some combination of mean-reversion and inflation surprises, with an extra move due to the dissipation of save haven status. If you are not comfortable navigating the shoals of credit and duration in the bond market or are not confident in your ability to read the signs in market moves, it may be a good time to invest in an active bond manager. With so many factors potentially impacting the bond market right now and into the foreseeable future, the expertise of an active manager may be the confidence-booster investors are seeking. For information on Astor’s Active Income SMA program, an active bond portfolio, contact your Astor sales representative for more information about availability and performance.